Dental Flipper And Partial Plate - What Are Flipper Teeth? A dental flipper is a small removable denture to replace one or two front teeth, and it is just ONE design of partial plate. Flipper teeth usually replace only a few teeth, not more than 3 teeth. A dental flipper is mostly made up of a pink acrylic plate that fits up into the roof of your mouth (your palate). The name "flipper" is a north american expression. It refers to the fact that the shape of the acrylic palate on the denture sometimes resembles a small flipper on a dolphin; Also, it's possible to "flip" the little plate out of position with your tongue. "Dental flipper" and "partial plate" can mean exactly the same thing, but the words "partial plate" are really a more general expression meaning any denture that replaces some teeth rather than all the teeth. Let's take a closer look at why you might want one. After all, having an acrylic plate in the roof of your mouth doesn't sound very attractive, does it! Imagine you need to have a front tooth taken out. Maybe you had an accident of some sort; the tooth is broken, and it can't be fixed. Or it's infected and a root canal won't work. Whatever the reason, you're looking at losing a front tooth, and you want something to replace it, like yesterday! We call this an immediate replacement, because the bad tooth is replaced with something at the same appointment, so you never have to walk around with a gap. With each of these options, it's important to understand that the "new tooth" you get on the day your real tooth is removed is only a temporary solution. It will fill the gap left by the missing tooth, but as the gum heals up it changes shape. At some point down the line, when it's all healed, you will need a more permanent tooth. If you are planning in the long-term on having a fixed bridge (sometimes called "fixed partial denture", just to confuse things! ), then it is possible to get a temporary version of that on the day of the tooth removal. On the other hand, if you are planning on either a removable denture or an implant, then it is likely that the dentist will offer you a dental flipper as the temporary tooth. It will fill the gap until everything has healed up and you're ready to go ahead with a more permanent option. A true dental flipper can be dislodged with your tongue. This is because it is designed to be as small as possible in your mouth. It is usually made up of just the acrylic tooth and a small piece of pink acrylic that fits into the roof of your mouth. In Britain it's also called a "spoon denture" because the bit of pink acrylic resembles the shape and size of a small dessert spoon. Flipper teeth are not held in place by any wires, clips or clasps. It stays in place because it wedges into the gap, against ONE tooth on either side of where the missing tooth used to be. The acrylic plate in the roof of your mouth should not go "in-and-out" around the other side teeth. If it does, it will fit more tightly, but can press on your other teeth, which may feel uncomfortable. Also, if it fits tightly against your own side teeth on the inside of your mouth, it may trap plaque against those teeth, putting them at risk of getting cavities. Nprmally, we can get away with the dental flipper fitting tightly into the gap where the tooth was removed, but otherwise the acrylic is just in the top of the roof of your mouth, NOT up against any side teeth. It also gets a bit of "suction" onto the roof of your mouth, without needing any more "grip". You should always remember that ANY denture or plate is an alternative to NOT HAVING a tooth or teeth. It is NOT an alternative to a REAL tooth or teeth. It just can't work the same way as a real tooth. One thing to be aware of with a dental flipper is that it will attract more plaque around your other teeth. The interesting thing is that it's not just the teeth next to the flipper. Having any sort of acrylic in your mouth seems to increase the plaque deposits on ALL your teeth. The best way to deal with this is by getting a GOOD quality sonic toothbrush. 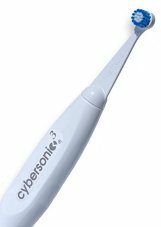 I recommend the Cybersonic 3 sonic toothbrush. I think it has the best performance of any brush I've tested, and you can get it at a great price (50% off) if you use the discount code on Best Sonic Toothbrush. I also recommend using a top-quality mouthwash. You should rinse this around your mouth for 60 seconds AFTER brushing. A great product is the TheraBreath Perio Therapy Oral Rinse. I like TheraBreath products. Have a look at the TheraBreath Oral Rinse on Amazon. With a dental flipper, you MUST have a realistic expectation of what you're going to get. One of my professors at dental school used to say, "you have to have realistic expectations about what a denture can do. Some patients expect too much. They expect a dental flipper to be just as good as the real thing. I always point out to them that they wouldn't expect to be able to see with a glass eye!" I used to think that he was joking, but as years have passed in my own career as a dentist, I have come to realise that what he said had a core of truth; A dental flipper can NEVER be like your original, natural tooth. It can LOOK pretty good, but you will not be able to eat or chew quite as well. And that is just a simple fact. BUT as a temporary replacement, so that you don't have to walk around with a tooth gap at the front of your mouth, a flipper can look very good! AND they are relatively quick and cheap to make. And for looking after your denture, I recommend that you take a look at my page called Best Denture Products. You can read more about the dental flipper at the Colgate website.